Ideal for soil enrichment and improvement. 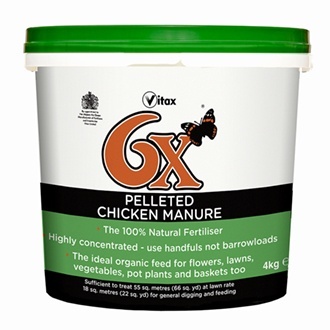 6X Pelleted Poultry Manure Fertiliser is a 100% natural fertiliser which is the ideal feed for nitrogen poor soils. Can be used all around your garden on vegetables, fruits, flowers, lawns and trees. Safe to use around pets and children. It is 6 to 8 times richer than old fashioned farmyard manure, so a little goes long way. Easy to use pellets are weed and bug-free. With trace elements, these will feed your soil to produce bumper crops and flowers. Can be used as a top dressing or when planting out.